Ships and other watercraft are used for maritime transport. Types can be distinguished by propulsion, size, or cargo type. Shipping may be for commerce, for recreation, or for military purposes. Most modern transport ships can be placed in one of a few categories. Bulk carrier, or, bulk freighter, is a merchant ship specially designed to transport unpackaged bulk cargo, such as grains, coal, ore, and cement, in its cargo holds. Since the first specialized bulk carrier was built in 1852, economic forces have fueled the development of these ships, causing them to grow in size and sophistication. Today’s bulk carriers are specially designed to maximize capacity, safety, efficiency, and durability. As of 1999, the International Convention for the Safety of Life at Sea defines a bulk carrier as “a ship constructed with a single deck, top side tanks and hopper side tanks in cargo spaces and intended to primarily carry dry cargo in bulk; an ore carrier; or a combination carrier” (van Dokkum 2003) which can be seen in Fig. 1. However, most classification societies use a broader definition where a bulk carrier is any ship that carries dry unpackaged goods. Multipurpose cargo ships can carry bulk cargo but can also carry other cargoes and are not specifically designed for bulk carriage. The term “dry bulk carrier” is used to distinguish bulk carriers from bulk liquid carriers such as oil, chemical, or liquefied petroleum gas carriers.Very small bulk carriers are almost indistinguishable from general cargo ships, and they are often classified based more on the ship’s use than its design (Frankel 1985). Today, bulk carriers make up 15–17% of the world’s merchant fleets and range in size from single-hold mini-bulk carriers to mammoth ore ships able to carry 400,000 metric tons of deadweight (DWT) (Haylar 2003). A number of specialized designs exist: some can unload their own cargo, some depend on port facilities for unloading, and some even package the cargo as it is loaded. Over half of all bulk carriers have Greek, Japanese, or Chinese owners, and more than a quarter are registered in Panama. South Korea is the largest single builder of bulk carriers, and 82% of these ships were built in Asia. Container ship is the cargo ship that carries entire load in truck-size containers, in a technique called containerization. They form a common means of commercial intermodal freight transport. Informally known as “box boats,” they carry the majority of the world’s dry cargo. Most container ships are propelled by diesel engines and have about 10 to 30 crew members. They generally have a large accommodation block at the stern, directly above the engine room. Since the 1960s the transport of containers has continued to grow. The specific advantage of the use of containers is that the cargo can be transported directly from customer to customer, and not just from port to port. The transport by water is just a link in the chain of transport. 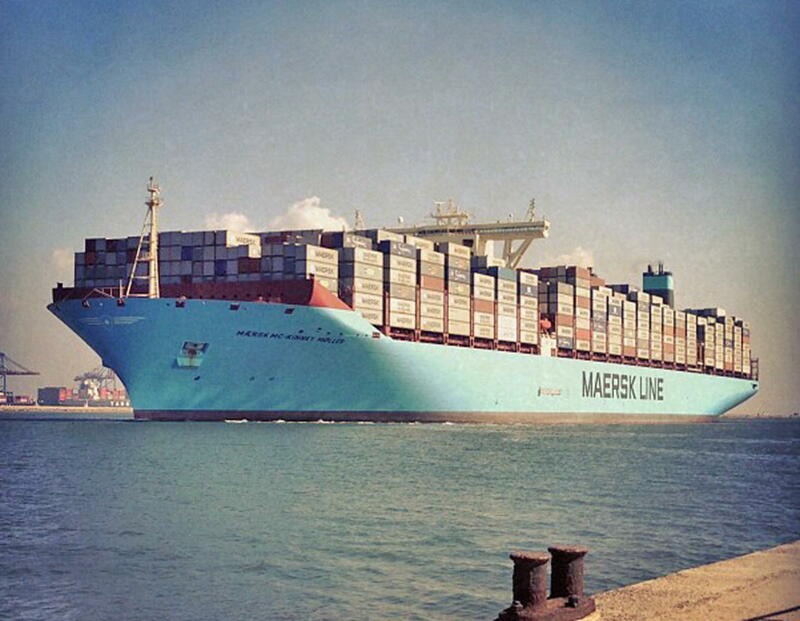 Container vessels have grown from a capacity of 1500 TEU (1966) to approximately 8000 (2002) (van Dokkum 2003). The sizes of containers vary. The ISO standards distinguish the TEU and the FEU, which may differ in height. TEU = 20 ft equivalent unit. The nominal length of these containers is 6.10 m. The actual length is 38 mm shorter, leaving some space between the containers. FEU = 40 ft equivalent unit. The nominal length of these containers is 12.20 m.
Today, about 90% of non-bulk cargo worldwide is transported by container ships, and the largest modern container ships can carry over 21,000 TEU. Container ships now rival crude oil tankers and bulk carriers as the largest commercial seaborne vessels. Container ships are distinguished into seven major size categories: small feeder, feeder, feedermax, Panamax, Post-Panamax, New Panamax, and ultra-large. As of December 2012, there were 161 container ships in the VLCS class (Very Large Container Ships, more than 10,000 TEU), and 51 ports in the world can accommodate them (Cudahy 2006). The size of a Panamax vessel is limited by the original Panama Canal’s lock chambers, which can accommodate ships with a beam of up to 32.31 m, a length overall of up to 294.13 m, and a draft of up to 12.04 m. The Post-Panamax category has historically been used to describe ships with a molded breadth over 32.31 m; however, the Panama Canal expansion project has caused some changes in terminology (Haylar 2003). The New Panamax category is based on the maximum vessel size that is able to transit a new third set of locks, which opened in June 2016; it can be found in Fig. 2. The third set of locks were built to accommodate a container ship with a length overall of 366 m (1,201 ft), a maximum width of 49 m (161 ft), and tropical freshwater draft of 15.2 m (50 ft). Such a vessel, called New Panamax class, is wide enough to carry 19 rows of containers, can have a total capacity of approximately 12,000 TEU, and is comparable in size to a capesize bulk carrier or a Suezmax tanker. Tankers are cargo ships for the transport of fluids, such as crude oil, petroleum products, liquefied petroleum gas (LPG), liquefied natural gas (LNG), and chemicals, also vegetable oils, wine, and other food – the tanker sector comprises one third of the world tonnage. 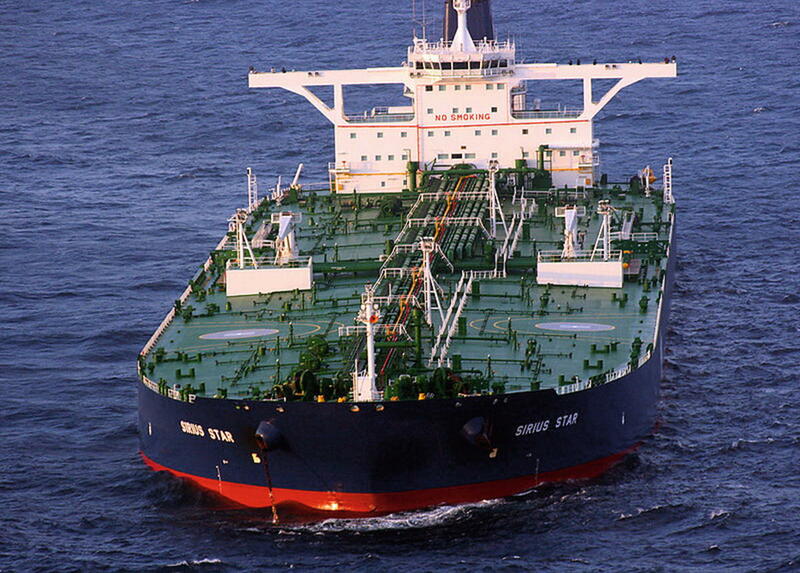 Major types of tankship include the oil tanker, the chemical tanker, and gas carrier. Tankers also carry commodities such as vegetable oils, molasses, and wine. In the US Navy and Military Sealift Command, a tanker used to refuel other ships is called an oiler (or replenishment oiler if it can also supply dry stores), but many other navies use the terms tanker and replenishment tanker (Wiltshire 2008). Refrigerated ships (usually called reefers) are cargo ships typically used to transport perishable commodities which require temperature-controlled transportation, mostly fruits, meat, fish, vegetables, dairy products, and other foodstuffs. 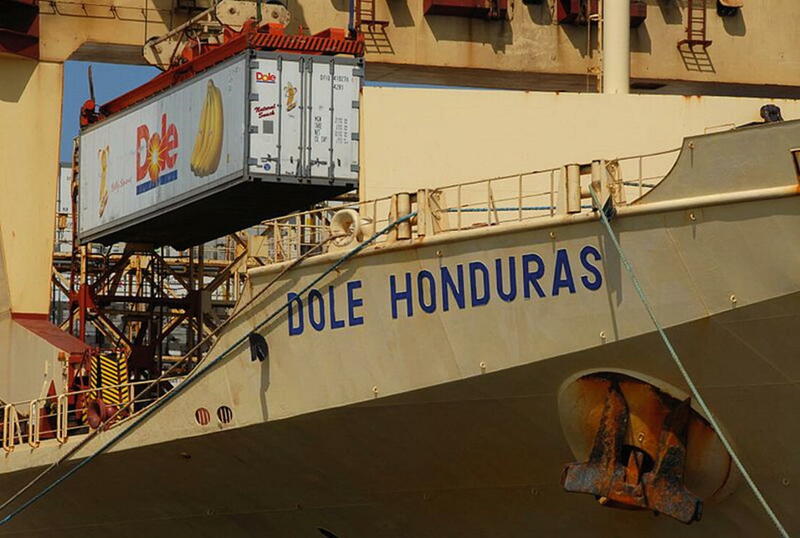 The reefer ship Dole Honduras unloading bananas is a kind of typical ship, as can be found in Fig. 4. Side-door vessels have watertight ports on the ship’s hull, which open into a cargo hold. Elevators or ramps leading from the quay serve as loading and discharging access for the forklifts or conveyors. Inside these access ports or side doors, pallet lifts or another series of conveyors bring the cargo to the respective decks. This special design makes the vessels particularly well suited for inclement weather operations as the tops of the cargo holds are always closed against rain and sun. Conventional vessels have a traditional cargo operation with top opening hatches and cranes/derricks. On such ships, when facing wet weather, the hatches need to be closed to prevent heavy rain from flooding the holds. Both above ship types are well suited for the handling of palletized and loose cargo. Refrigerated container ships are specifically designed to carry containerized unit loads where each container has its individual refrigerated unit. These containers are nearly always 20 ft equivalent units (often called TEU) that are the size of “standard” cargo containers that are loaded and unloaded at container terminals and aboard container ships. These ships differ from conventional container ships in their design, power generation, and electrical distribution equipment. They need provisions made for powering each container’s cooling system. Because of their ease of loading and unloading cargo, many container ships are now being built or redesigned to carry refrigerated containers (Kohli 2000). Roll-on/roll-off (RORO or ro-ro) ships are vessels designed to carry wheeled cargo, such as cars, trucks, semitrailer trucks, trailers, and railroad cars, that are driven on and off the ship on their own wheels or using a platform vehicle, such as a self-propelled modular transporter (Emi 2006). Types of RORO vessels include ferries, cruiseferries, cargo ships, barges, and RORO service for air deliveries. 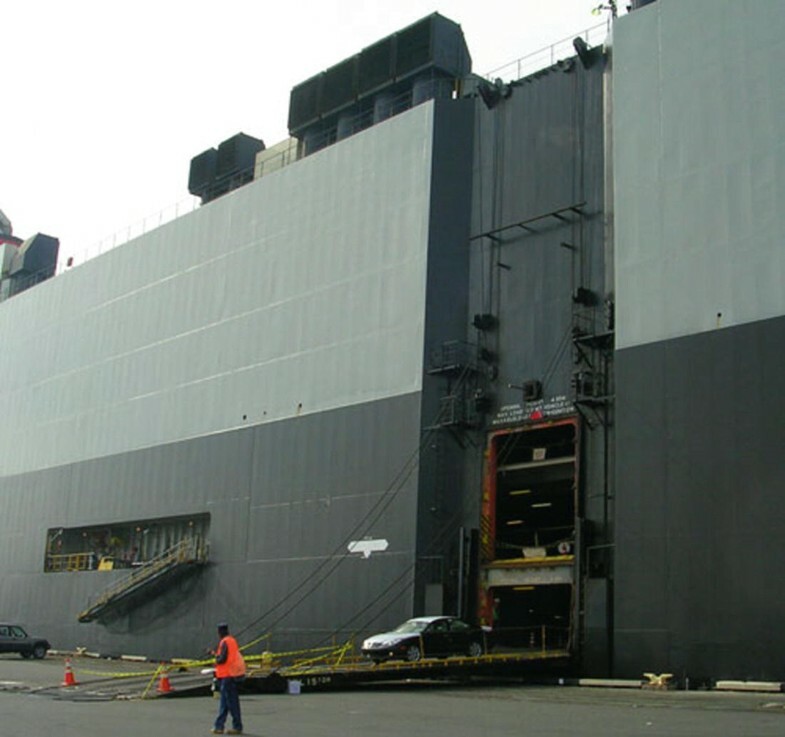 New automobiles that are transported by ship are often moved on a large type of RORO called a pure car carrier (PCC) or pure car/truck carrier (PCTC). Elsewhere in the shipping industry, cargo is normally measured by the metric ton, but RORO cargo is typically measured in lanes in meters (LIMs). This is calculated by multiplying the cargo length in meters by the number of decks and by its width in lanes (lane width differs from vessel to vessel, and there are several industry standards). On PCCs, cargo capacity is often measured in RT or RT43 units (based on a 1966 Toyota Corona, the first mass-produced car to be shipped in specialized car carriers and used as the basis of RORO vessel size. 1 RT is approximately 4 m of lane space required to store a 1.5 m wide Toyota Corona) or in car-equivalent units (CEU). Figure 5 shows a pure car carrier ship’s starboard side. The largest RORO passenger ferry is MS Color Magic, a 75,100 GT cruise ferry that entered service in September 2007 for Color Line. 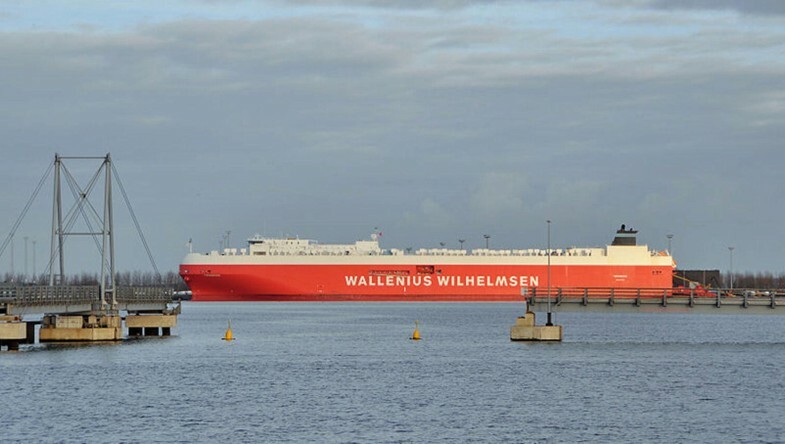 Built in Finland by Aker Finnyards, it is 223.70 m (733 ft 11 in) long and 35 m (114 ft 10 in) wide and can carry 550 cars or 1270 lane meters of cargo. The RORO passenger ferry with the greatest car-carrying capacity is Ulysses, owned by Irish Ferries. Ulysses entered service on 25 March 2001 and operates between Dublin and Holyhead. The 50,938 GT ship is 209.02 m (685 ft 9 in) long and 31.84 m (104 ft 6 in) wide and can carry 1342 cars/4101 lane meters of cargo (Fig. 6). The PCTC has liftable decks to increase vertical clearance, as well as heavier decks for “high-and-heavy” cargo. A 6,500-unit car ship, with 12 decks, can have three decks which can take cargo up to 150 short tons (136 t; 134 long tons) with liftable panels to increase clearance from 1.7 to 6.7 m (5 ft 7 in to 22 ft 0 in) on some decks. Lifting decks to accommodate higher cargo reduces the total capacity. These kinds of vessels perform a usual speed of 16 knots at eco-speed, while at full speed can achieve more than 19 knots. With the building of Wallenius Wilhelmsen Logistics’s 8,000-CEU car carrier Faust out of Stockholm in June 2007, car carriers entered a new era of the large car and truck carrier (LCTC) (Llovio 2007). Currently, the largest are Hoegh Autoliners Six Horizon class vessels with capacity of 8,500 CEU each. The car carrier Auriga Leader, belonging to Nippon Yusen Kaisha, built in 2008 with a capacity of 6,200 cars, is the world’s first partially solar-powered ship. Ocean liner is the passenger ship primarily used as a form of transportation across seas or oceans. Liners may also carry cargo or mail and may sometimes be used for other purposes (e.g., for pleasure cruises or as hospital ships). Ocean liners are usually strongly built with a high freeboard to withstand rough seas and adverse conditions encountered in the open ocean. Additionally, they are often designed with thicker hull plating than is found on cruise ships and have large capacities for fuel, food, and other consumables on long voyages. The first ocean liners were built in the mid-nineteenth century. Technological innovations such as the steam engine and steel hull allowed larger and faster liners to be built, giving rise to a competition between world powers of the time, especially between the United Kingdom and Germany. Once the dominant form of travel between continents, ocean liners were rendered largely obsolete by the emergence of long-distance aircraft after World War II. Advances in automobile and railway technology also played a role. 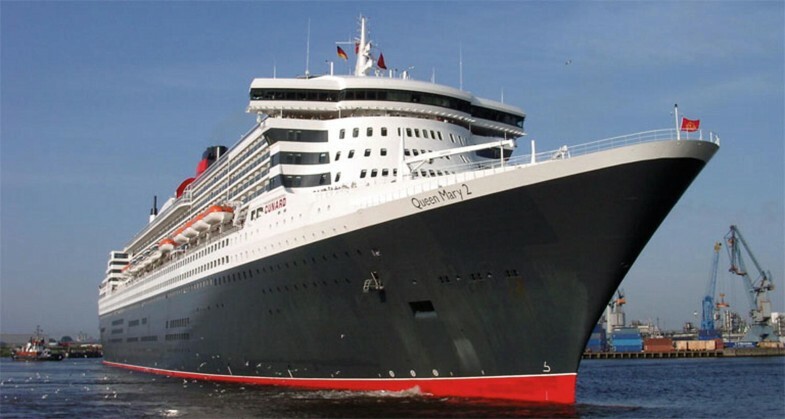 By 2015, RMS Queen Mary 2 is the only ship still in service as an ocean liner, the RMS Queen Elizabeth 2 having retired a few years prior; it can be seen in Fig. 7. Ferries are a form of transport, usually a boat or ship, but also other forms, carrying (or ferrying) passengers and sometimes their vehicles. Ferries are also used to transport freight (in lorries and sometimes unpowered freight containers) and even railroad cars. Most ferries operate on regular, frequent, return services. A foot-passenger ferry with many stops, such as in Venice, is sometimes called a water-bus or water taxi. Ferries form a part of the public transport systems of many waterside cities and islands, allowing direct transit between points at a capital cost much lower than bridges or tunnels. Ferry boats often dock at specialized facilities designed to position the boat for loading and unloading, called a ferry slip. If the ferry transports road vehicles or railway carriages, there will usually be an adjustable ramp called an apron that is part of the slip. In other cases, the apron ramp will be a part of the ferry itself, acting as a wave guard when elevated and lowered to meet a fixed ramp at the terminus – a road segment that extends partially underwater. Some of world’s busiest ferry routes include the Star Ferry in Hong Kong and the Staten Island Ferry in New York City. 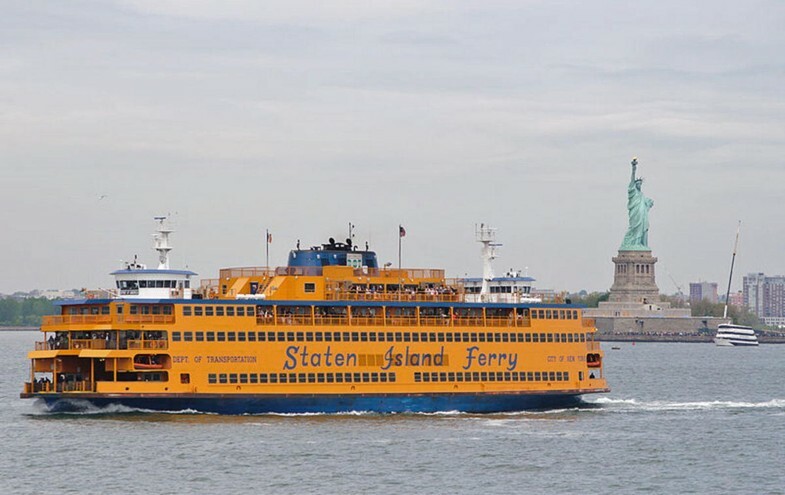 The Staten Island Ferry is shown in Fig. 8. Bulk carriers are usually discharged by grabs or by suction pipes. Pouring the cargo through a shooter or via a conveyor belt doses the loading. 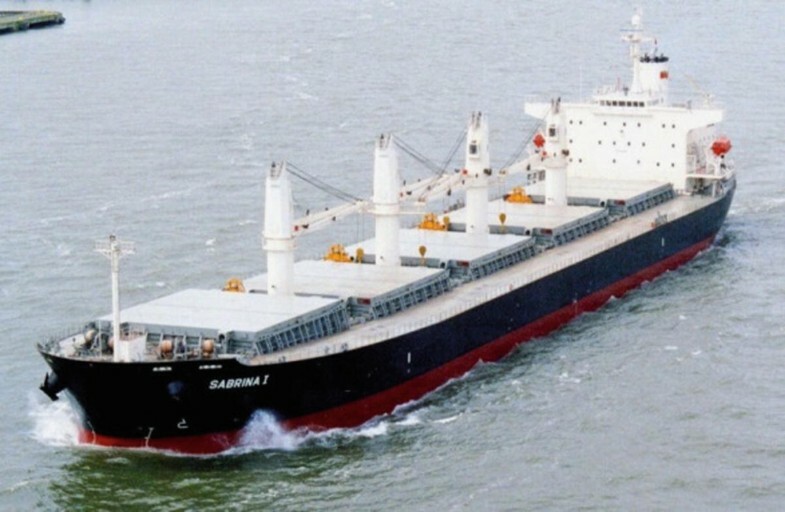 Bulk carriers have large upper and lower ballast tanks to give the empty vessel enough draft and a better behavior while in transit (van Dokkum 2003). Ship transporting ore have a special design. Ore is very heavy (stowage factor is approximately 0.5 m3/t), and thus ships only need small holds to be loaded completely. To prevent a too large stability, the holds must not be situated too low or too close to the sides of the ships. Some bulk carriers can also function as a tanker. Loading and discharging: Bulk liquids must be pumped – The development of efficient pumps and piping systems was vital to the development of the tanker. Steam engines were developed as prime movers for early pumping systems. Dedicated cargo handling facilities were now required ashore too – As was a market for receiving a product in that quantity. Casks could be unloaded using ordinary cranes, and the awkward nature of the casks meant that the volume of liquid was always relatively small – Therefore keeping the market more stable. Free surface effect: A large body of liquid carried aboard a ship will impact on the ship’s stability, particularly when the liquid is flowing around the hold or tank in response to the ship’s movements. The effect was negligible in casks but could cause capsizing if the tank extended the width of the ship, a problem solved by extensive subdivision of the tanks. Maritime transport can be realized over any distance by boat, ship, sailboat, or barge, over oceans and lakes, through canals, or along rivers. While extensive inland shipping is less critical today, the major waterways of the world including many canals are still very important and are integral parts of worldwide economies. Virtually any material can be moved by water; however, water transport becomes impractical when material delivery is time-critical such as various types of perishable produce. However, water transport is highly cost-effective with regular schedulable cargoes, such as transoceanic shipping of consumer products – and especially for heavy loads or bulk cargos, such as coal, coke, ores, or grains. Arguably, the industrial revolution took place best where cheap water transport by canal, navigations, or shipping by all types of watercraft on natural waterways supported cost-effective bulk transport. Recreational or educational craft still use wind power, while some smaller craft use internal combustion engines to drive one or more propellers or, in the case of jet boats, an inboard water jet. In shallow draft areas, such as the Everglades, some craft, such as the hovercraft, are propelled by large pusher-prop fans.